Who built the pyramids on the Giza Plateau? Do the pyramids portray the 3 stars in the belt of Orion constellation? Fingerprints Of The Gods, by Graham Hancock, 1995. The Orion Mystery, by Robert Bauval, 1994. The Message Of The Sphinx, by Graham Hancock & Robert Bauval, 1996. According to the theory proposed by Bauval & Hancock, the pyramids and Sphinx at Giza were originally laid out to point to a date in 10,450 BC by an ancient advanced civilization that was wiped out in a catastrophic pole shift. The Sphinx would have represented the constellation Leo ascending in the sky. Why then the link to the stars in the belt of Orion? Sirius the dog star, a binary star system close to earth, has a helical path of 365.25 days, which is the length of a year. The ancient Egyptians tracked Sirius in order to determine the year. When Sirius was rising, it corresponded to New Year's Day in ancient Egypt. This information was known and used by other ancient civilizations too. Now, getting to Orion. The earth has a grand cycle of precession of the equinoxes with a length of ~26,000 years. The ancients tracked the 12 constellations of the zodiac which are equatorial constellations, and each ~2165 years, a new age would occur, where the constellation was pre-eminent as seen by looking from behind the Sphinx toward the Nile River. For example, we are just leaving Pisces and going into Aquarius. The constellation Orion is the means to track the 26,000 year precession of the equinoxes. Orion moves upward for 13,000 years and then downward for 13,000 years in a cycle. Just as Sirius tracked the length of the year, so the 3 stars in the belt of Orion tracked the precession of the equinoxes. October 1999 USAF photo of pyramid Menkaura and the 3 small Queen's Pyramids partially obscured to the south. 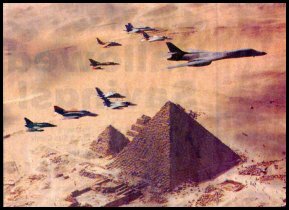 The planes of Operation Bright Star 99 are led by a USAF B1-B bomber, followed by fighters from Egypt, Jordan, Italy, and France. Menkaura is the smallest of the 3 large pyramids on the Giza Plateau, and corresponds to the star Mintaka in the belt of Orion constellation. At its low point, the brightest star in the belt of Orion, Alnitak, is at a declination of 11 degrees and 8 minutes above the horizon. At its high point 13,000 years later, Alnitak is 58 degrees 11 minutes of declination above the horizon. From the work of Hancock and Bauval, they theorize that the Giza Plateau pyramids and Sphinx were laid out to portray a specific point in time, when the constellation Leo was in ascension and Alnitak was at its lowest declination point of 11 degrees and 8 minutes. Today, as the constellation Aquarius is in ascension, we are just entering the point where Alnitak of the belt of Orion is at its highest declination of 58 degrees 11 minutes above the horizon as viewed at Giza. Aquarius also happens to be the opposite sign in the zodiac from Leo the Lion when you see the zodiac portrayed as a circle. This is why many ancient cultures have cited our time as the point in which massive earth changes will occur. They believed that at the lowest and highest points in the movement of Alnitak in the constellation Orion, that God would recycle mankind. This includes the Mayan and Aztec calendars, the Hopi Indians, the Tibetan monks and Dalai Lama, the Sumerians, etc. Of course, Christians and Jews too believe that we are in a momentous time period, when the 6000 years from Adam & Eve are being completed. Then the 7th 1000 year period will be a time of rest from labors, called the Millennium, when the Messiah will reign on the earth in Jerusalem. That's the background, now I'd like to step on everyone's toes for a moment. Have you considered that at the time Moses led the children of Israel from Egypt, that the zodiac constellation Taurus the Bull was leaving and the constellation Aries the Ram was in ascension? God had instituted a new covenant at Mount Sinai where the sacrifice of rams and lambs substituted for sins. Yet, when Moses was on Mount Sinai getting the 10 commandments, the people reverted back and created a golden calf to worship. The golden calf was a pagan ritual which recognized the zodiacal sign just leaving, that of Taurus the Bull. Later, the earth entered the period of ascension of the constellation Pisces the Fish just before the appearance of Yeshua (Jesus) in His earthly ministry. It is no wonder that the superstitious people of earth adopted the sign of the fish for Christianity, as you see on many cars today. People have always been drawn to mix pagan symbols into their religion. Likewise, the Roman Catholic church with the mitered hats worn by the Pope and Cardinals are in the shape of a fish head with an open mouth pointing upwards. We entered the age of Pisces and the people adopted fish symbols so that even though Christian, they wanted to mix in the pagan worship of the gods from the zodiac. Don't write me and tell me these mean something else than just stated, since it is apparent to me that they represent Pisces the Fish. Now that we are entering Aquarius, will Christians adopt symbols related to the water pourer, and perhaps explain that it represents the pouring out of the Holy Spirit to the people on earth? Come to think of it, if Yeshua comes to earth to reign soon, as the Messiah. then this will occur. The above is the background for the matrix below. In developing a matrix on the pyramids at Giza, the matrix quickly became too complicated to show you in one fell swoop, so I've decided to do a Part 1, with a simplified matrix (~20 terms) and show that the matrix has all the relevant major points. In a few weeks, I will put the entire matrix online that shows latitude and longitude, declinations of both the high point and low point, and much more than shown in the matrix below. In simplifying the matrix below, I have only left turned on 1 occurrence of the names above, there were more. Also, the name Mycerinus was in the matrix, but it required a larger view, so I decided to use a smaller view of the matrix, and leave Mycerinus out. In the matrix is also the term Orion, and Giza Plateau. The matrix is very clear that the 3 pyramids at Giza Plateau were built to represent the constellation Orion, even when simplified as below. Also in the matrix, I give a hint of "who built it", at least for the Great Pyramid. There are ancient writings called the "Works of Joseph" which are supposedly from the Joseph in the Bible. He became second in command to the pharaoh and gathered up and stored grains during the 7 bountiful years, and then sold the grain during the 7 years of intense famine over all the earth. The Works of Joseph state that he instituted the pyramids project as a sort of huge public works project to put people to labor during the 7 years of famine. That will be further explored in part 2 with the more advanced matrix, but the hint of it is here in this simplified matrix. When looking at the matrix, notice that the star names are on the left side of the matrix, from the center term, pyramid. The order of the star names from top to bottom is Alnitak, Alnilam, and Mintaka, which corresponds to great pyramid, middle pyramid, and small pyramid. In the right half of the matrix, the same order from top to bottom is Khufu, Khafre, and Menkaura, which corresponds to great pyramid, middle pyramid, and small pyramid. So the star names and Egyptian names are in the same order in the two halves of the matrix. Some of you may ask, "Roy, if you are a Christian, then considering the biblical 6000 years timeline from Adam & Eve, how can you bring up the possibility that the Sphinx and Giza pyramids were laid out in 10,450 BC?" Good question and relevant. I do believe that Adam & Eve were created ~6000 years ago. However, I also believe that there is ample archaeological evidence for a pre-current-civilization that was very advanced. So in my cosmological view, the ancient civilization was completely wiped out by a pole shift around 10,000 BC. This pole shift moved the locations of the North and South poles. Previously, they were located with the North Pole over the Great Lakes region and the South Pole over the Indian Ocean. Textbooks today teach that there was an ice age, but that is wrong. There was no ice age for the earth, it's just that the North and South Poles were in different places. That's why they found Woolly Mammoths in the northern Siberia, flash frozen with buttercups still in their mouths. Northern Siberia was a temperate climate when the poles were previously located in a different place. Also, the southwestern US desert area shows that at one time it was a much more temperate climate with plentiful rainfall. That's because it was, when the North Pole was over the Great Lakes area. Egypt was once a much more temperate climate and all of Northern Africa that is now desert, once was a teeming place with forests, lakes, and animals. That's because it was, before the pole shift. I reconcile all this by viewing the creation of Adam & Eve as a re-start of people, plants, and animals on the earth. God re-created the earth with some different plants, different animals, and people. That was the creation story as recorded in the Bible. Why wouldn't God tell us about the pre-civilization in the Bible? Because it serves no purpose for you to know. There is ample evidence that this pre-civilization was very advanced. At that time, Antarctica was a nice temperate climate, about the size of the U.S. I think we will find this pre-civilization evidence under the ice in Antarctica. The ancient Piri Reis map and others show Antarctica when free from ice and populated. My belief system is that the story of Adam & Eve is true as shown in the Bible, however, there was an ancient pre-civilization that may have been as advanced as we are today. This view is not at all in opposition to the teachings in the Bible. In Genesis 1, it says that God created out of the chaos that already existed. We don't know how much He used of what was already there. What we are starting to find out is that the Bible code may tell us about this ancient pre-civilization without disrupting or harming the biblical teachings. That's another story for another Bible code project down the road. Part 2 of this scenario and matrix will be online in a few weeks. This matrix and the more advanced matrix were created using the CodeFinder program in the space of about a week in my spare time. With the advancements in the Bible code programs today, practically anyone can do this sort of research. My pitch is to get other people involved, since there is enough in the Bible code to satisfy as many people as want to do the work. Take a chance, and start doing it.